FAYETTE COUNTY, Texas (KXAN) — More than $200,000 in cash was found stashed in a spare tire of a truck pulled over in Fayette County on Friday, according to the sheriff's office. Drug Interdiction Investigator David Smith pulled over a Ford pickup for a traffic violation near Flatonia, Texas. The driver and passengers allowed him, Sgt. Randy Thumann and K9 Kolt to search the truck, according to a release. Smith found 27 wrapped bundles of money inside the truck's spare tire, totaling $209,524. Silverio Gonzalez, 58, of McAllen, Texas was arrested and faces a money laundering charge. The other people in the pickup were taken to the sheriff's office to wait for their family members. AUSTIN (KXAN) — Austin police have identified a suspect accused of robbing a woman at gunpoint and sexually assaulting her at her north Austin apartment. Jacob Rodriguez, 36, is currently in custody in Caldwell County on unrelated charges, police say. They are working to file warrants in this case Monday afternoon. 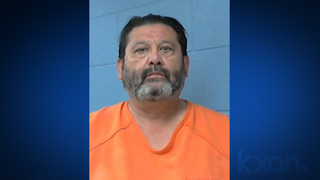 According to police, on April 15, the victim talked to two people — a man and a woman — in her apartment complex at the 8800 block of north Interstate 35, which is south of East Rundberg Lane. The couple asked for directions to a nearby store. Some time later, the man returned to the victim's door, where he asked for a ride to the gas station. The victim obliged. Hopkins was booked into the Dona Ana County detention center in Las Cruces and it wasn't immediately known whether he has an attorney who could comment on the allegations. AUSTIN (KXAN) — Sometime, likely in the morning hours of August 30, 2018, a woman living in the 1900 block of Platte Pass in the Apache Shores neighborhood of Travis County, was attacked and left for dead. She, along with her four-year-old daughter, are believed to have been beaten with a baseball bat found inside the home. The suspect who attacked them has yet to be found. Nearly eight months after the attack, law enforcement has renewed its efforts to find the suspect involved. Both victims survived the attack but received significant injuries to their skulls. The woman spent almost six weeks in the hospital recovering. For two of those weeks, she was in a coma.